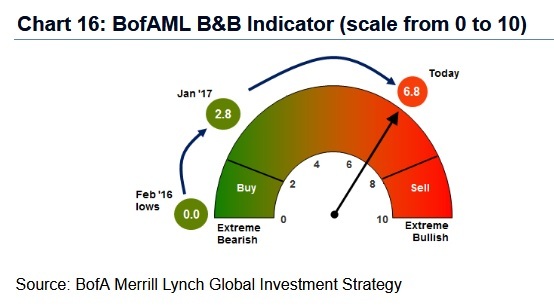 Bank of America Merrill Lynch’s Bull Bear indicator is now at 6.8, down from a value of 7.6 in the previous week, which was close to the Sell signal of 8. Of the indicator’s six components, only one is very bearish: bond flows. Hedge funds positioning, credit market technicals and equity flows are very bullish, whereas stock market breadth and long-only positioning are bullish. But the Bull Bear indicator has a long way to travel (downwards) before it triggers a Buy signal: it will only do so once it hits 2. If the current policies on trade continue at the same pace, chances are the markets will fall far enough and fast enough for it to trigger that contrarian Buy signal. The US has shot another salvo in the protectionism war with President Donald Trump’s tariffs on steel and aluminium and the European Union looks set to retaliate. Already, Brexit-prone Britain is seeking to negotiate an exemption from the US tariffs, which is at odds with its current negotiations with the EU. This coincides with the end of asset-buying by major central banks and the ever-so-slow tightening of monetary conditions. The asset purchases that followed the financial crisis have inflated asset prices, deepening the divide between haves and have-nots, and now governments are scrambling to keep public discontent at bay. So far, the game has been to blame the foreigner. Xenophobic movements and leaders, such as Nigel Farage — who has been stirring up racial tensions in the UK – and the Five Star movement in Italy, have been very efficient at deflecting attention from the fact that measures taken post-crisis have in effect been a way to bail out rich people. These measures have helped too big to fail companies to grow even bigger, because low interest rates have spurred mergers and acquisitions. The pay of company executives has increased dramatically, while workers’ pay has been lagging. The home-grown widening inequalities in rich countries have been blamed by politicians good at manipulating public opinion on globalisation and the EU. Ordinary people in most of these countries have been skilfully directed towards hating vulnerable groups such as immigrants and refugees. With the end of asset purchases by central banks, this policy is now continuing in the form of trade protectionism, which will again benefit the rich to the detriment of the poor. The rich have more disposable income, so they will not suffer as much from the inflation that higher tariffs might cause. For a while, then, the show will stay on the road. The stocks of companies that benefit from protectionist measures are likely to go up in the short-term, but over the longer term, these policies will prove to be very harmful. New ideas and business opportunities do not thrive in environments where certain companies and sectors are protected to the detriment of others. Just look at how Britain’s ultra-subsidised property sector has been distorting the economy by turning resources and skills away from productive industries towards the rent-seeking sector.